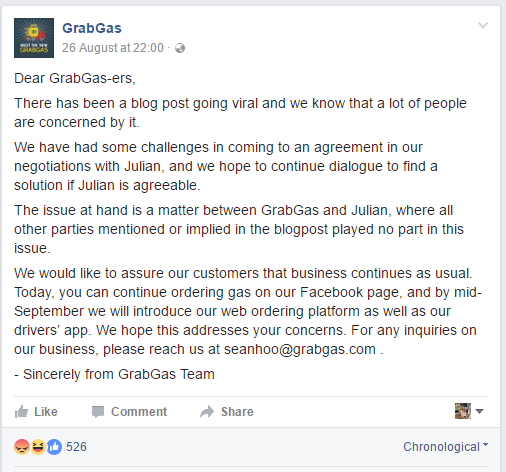 It’s been a week since Julian Ee’s post blew up in the startup world and embroiled GrabGas in controversy. There have been many responses to what Julian shared, but of course, all eyes were on the team at the center of the controversy to see their comments and reactions. 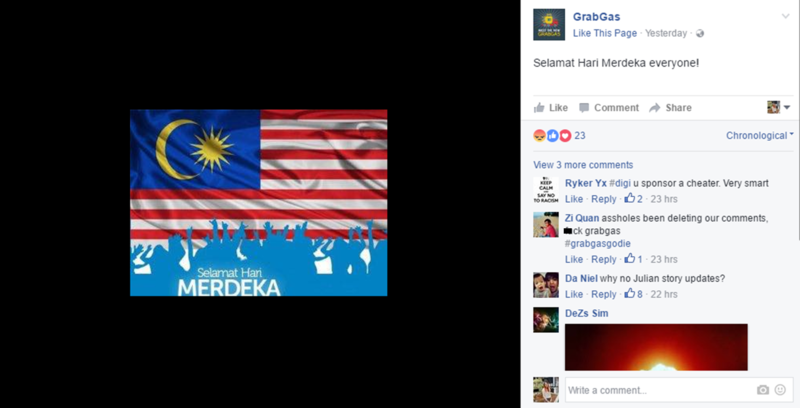 All we got from them instead was this one post on their official Facebook page. As of the time of writing, 373 Facebook users chose to react with the Angry emoticon to that posting, which, though it isn’t an exact measure, is a kind of litmus test as to how people are feeling about something. We break down what GrabGas has done so far, and look at other ways they could have tried to handle the entire fiasco. 1. Their one and only response was severely lacking. In a situation like this, there’s usually only one question on everyone’s mind: Who did it? Translated, everyone is wondering, what’s the real story and who’s in the wrong? The online witchhunts need to begin, after all. Julian made a lot of claims, but he did attempt to substantiate his words with proof, showing screenshots of conversations in particular. The GrabGas team had the way clear before them, since the ball was in their court. They could have refuted Julian’s words and provided their own proof of innocence, or they could have admitted it and found some solution to move on. What they chose instead was basically to tell everyone that it was strictly between them and Julian. That’s not the answer anyone wants. By trying to keep everyone out, they’ve basically alienated themselves, even from the people who might have been on their side. Also, their reputation and integrity were put into question. If they make no effort to step forward and clear it up or make amends (depending on the “real” situation), they are not being accountable to their users and investors. This is a very obvious lack of transparency. No matter how good their service is, if they don’t take the responsibility of addressing such issues, it’s hard to continue to trust in them. With Julian signing out, a response from GrabGas is warranted, just as closure or for an explanation. 2. They’re carrying on as if nothing is happening. One of the results of the fallout, according to Julian, is that he took all the tech he developed while at the company with him when he left. 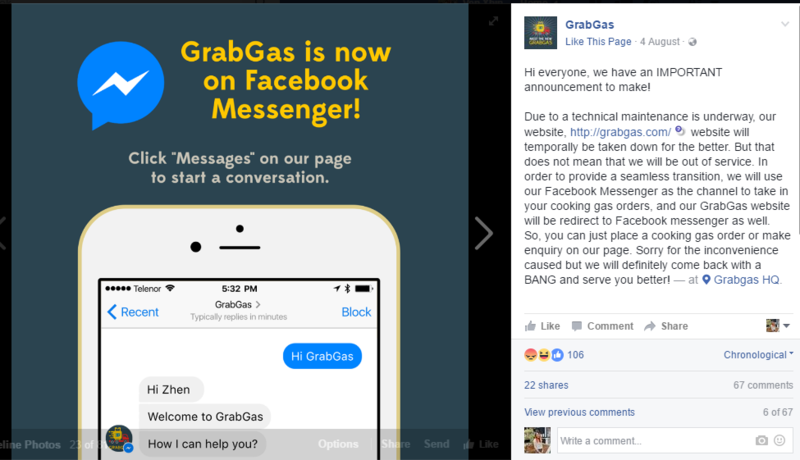 It’s true that life and work must go on, so GrabGas has transferred operations to Facebook messenger and taken their main website offline. However, their attempt at continuing with normalcy in the face of what is a PR disaster is hardly going to be well received by people waiting for answers. Even if GrabGas wants to put this behind them, it’s obvious that the public isn’t ready to move on yet. Pretending that everything is alright is not going to fly. Also, if the accusations are true, them deleting comments will not inspire any confidence or give them any brownie points. 3. They didn’t put everything down in black and white. This lesson could probably also apply to Julian, but one of the main reasons all this blew up was because no proper agreements were made from the start. It’s become a case of “he said, she said” and all this could have been avoided if a proper contract and understanding had been reached from the beginning. Also, making him sign a NDA when he had come on could have nipped any PR problems like this instantly before anything happened. 4. They underestimated how important tech is. If you can take Julian’s word for it, the tech component was not a priority for them. Seeing as he must have left sometime early in August (if we base the timelines on when their website went down), then it’s been almost a month since they lost their CTO. For almost a month, they’ve been taking orders through Facebook. Even if Julian had left with what’s he built, it’s obvious they were not paying enough attention to that aspect. Almost a month of operations without a key part of your business running properly is a very long time for this modern day and age. 5. They failed to put employee welfare as a priority. The startup industry can be very cutthroat, and obviously long hours and backbreaking work tend to be part of the package. However, an employer should have noticed such warning signs that Julian was exhibiting and taken preemptive measures before that. Even if Julian is just a disgruntled ex-employee venting his anger online, what he has mentioned in his post hints at a larger problem. There shouldn’t be promises made or things said just to get people on board, then abandoned once things take off, which seems to have been the case in this situation. 6. They had a major mismatch of expectations. At the very least, anyone coming on board should have had things very clearly spelt out for them, and again, in black and white as a contract. It’s clear that this fiasco also came about because Julian had one set of expectations for himself and his role in the company, whereas the rest had another idea in mind. Of course, it’s easy in retrospect and as an outsider to make all these comments, but if GrabGas doesn’t step up their game fast, it might be hard to get new customers on board and retain the old ones. Their investors are probably watching their every move and launching investigations of their own, so GrabGas should be upping their efforts and fixing the mess, instead of attempting to just ride it out by ignoring it. GrabGas’ Ex-Developer Calls The Startup Out In A Blog Post. Here Is Our Response.